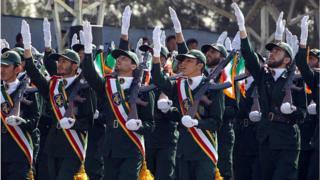 US President Donald Trump has designated Iran’s elite Revolutionary Guard Corps (IRGC) as a foreign terrorist organisation. It is the first time the US has labelled another nation’s military as a terrorist organisation. Iran retaliated by declaring US forces in the Middle East as a terrorist organisation, Iran state news reported. Labelling the Guards as a terrorist organisation will allow the US to impose further sanctions – particularly affecting the business sector, given the IRGC’s involvement in Iran’s economy. A number of IRGC and affiliated entities have already been targeted by US sanctions for alleged proliferation activities, support for terrorism and human rights abuses. The president added that the move was meant to “significantly expand the scope and scale” of pressure on Iran. “If you are doing business with the IRGC, you will be bankrolling terrorism,” Mr Trump said. The measure will take effect in one week’s time, according to the State Department. Was there any dissent in the Trump administration? US Secretary of State Mike Pompeo and National Security Adviser John Bolton, both Iran hawks, championed the decision, but not all US officials were so supportive. 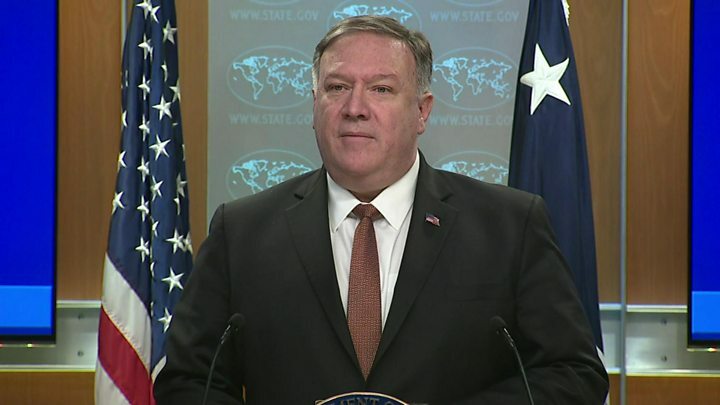 Mr Pompeo told reporters on Monday the US will continue to sanction and pressure Iran to “behave like a normal nation” and urged America’s allies to take similar action. Mr Bolton said labelling the IRGC as terrorists was “the rightful designation”. But some Pentagon officials, including Joint Chiefs of Staff Chairman Gen Joe Dunford, had expressed concerns about troop safety, the Wall Street Journal reported. Military officials cautioned the designation could incite violence against US forces in the Middle East without severely impacting Iran’s economy. The Central Intelligence Agency had also reportedly opposed the move. Iran’s national security council declared US Central Command (Centcom) a terrorist organisation after Foreign Minister Javad Zarif wrote to President Hassan Rouhani urging such a response, state news channel IRINN said. The Islamic Republic had warned it would retaliate in kind last week, after reports of the Trump administration plan first surfaced. “We will answer any action taken against this force with a reciprocal action,” a statement issued by 255 out of the 290 Iranian MPs said, according to the state-run IRNA news agency. But Israeli Prime Minister Benjamin Netanyahu, who is battling for political survival in Tuesday’s elections, cheered the US move. Thank you, President @realDonaldTrump for your decision to designate the Islamic revolutionary guards as a terrorist organization. Once again you are keeping the world safe from Iran aggression and terrorism. This move underscores the Trump administration’s desire to isolate and stigmatise Iran, though it is unlikely to have a significant impact upon the Revolutionary Guard Corps’ activities. Few Western commentators would disagree that the IRGC is responsible for all sorts of disruptive activities in the region and beyond. But many – including it seems some officials in the US Department of State and the Pentagon – fear that this step could simply backfire. The fear is that it could encourage the IRGC or its proxies to take action against US personnel or other targets in places where they might be vulnerable, for example in Iraq. What this move does do is signal the unremitting desire of the Trump Administration to ramp up its battle with Tehran which some fear may, one day, spill into open military conflict. Iran’s most elite military unit, the IRGC was set up shortly after the 1979 Iranian revolution to defend the country’s Islamic system, and to provide a counterweight to the regular armed forces. It has since become a major military, political and economic force in Iran, with close ties to the Supreme Leader, Ayatollah Ali Khamenei, and many other senior figures hailing from its ranks. The IRGC is estimated to have more than 150,000 active personnel, boasts its own ground forces, navy and air force, and oversees Iran’s strategic weapons, including its ballistic missiles. The IRGC exerts influence elsewhere in the Middle East by providing money, weapons, technology, training and advice to allied governments and armed groups through its shadowy overseas operations arm, the Quds (Jerusalem) Force.